Roof Cleaning and Roof Repairs London. A roof is often the most neglected part of any building or we can say, it is the only part that is taken for granted among walls and floors. However, taking care of the roof is equally important, because even a little damage can lead to hefty internal water damage and subsequent repair expenses. Water Damage provides regular roof cleaning, maintenance, and both temporary roof repairs and permanent roof repairs, so as to prolong your investment. We have a team of licensed, qualified, and expert roofing professionals who will respond to perform the very best roof repairs, planned or in an emergency. There could be multiple reasons as to why a roof may require repairs; depending on how old the roof is, how it has been treated or what is it is used for, to fires and simply building movement having undermined the membrane. 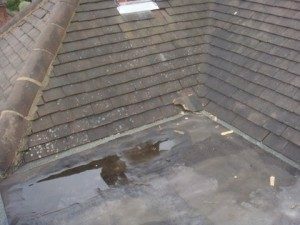 When water gets under a roofing membrane, it will still try and evaporate and in the process can cause the roof to blister or deteriorate. We specialise in repairing roofs; we always strive to save your roof instead of replacing it. Some companies will simply look at your roof and say “you need a new roof.” We will look at the best possible way to save you having to replace your roof by using the very best and most appropriate roof repair products. One of the most common problems with flat roofs is that, over time, the points (roof upstands), where the roof membrane makes contact with the parapet walls or upstands, can start to fall away or deteriorate. This then allows water to ingress through and cause internal damage – sometimes gradual, but often severe. The experts at Water Damage can repair upstands, repair flashings, repair cracks, and repair all types of roof membranes and roof surfaces to prevent leaks. Our roof repairs team are always well equipped and ready for almost any situation. We can also provide roof ventilation and insulation solutions compliant with building regulations. Water Damage has you covered 7 days a week, 52 days a year. Whether you have damp patches on your ceiling, a leaking ceiling, a dripping ceiling, a bowing ceiling, or just blocked drains and a flooded roof – from a minor defect to a major leakage – we can fix it right then and there upon call out, and provide you with a professional report containing thermal images and ultrasound readings to prove to your insurance if necessary just how far the damp has spread. We are considerate of your convenience and so we observe sheer professionalism and make every effort not to move anything that doesn’t seek our concern. Once the roof repairs are complete, we clean our mess/ remove all related debris, and leave your premises as tidy as it was at the time when we arrived. Further, if there’s anything you want to be done about your existing roof, seek our consultation so as to make a well-informed choice.